Ph.D. in Law prepares future lawyers for global leadership in the judiciary, academia, business and government. The program offers a selected batch of students from diverse backgrounds, the opportunity to attain their highest professional aspirations and career goals at a most excellent center for interdisciplinary legal studies. Our graduate students receive individualized attention and guidance from exceptional faculty and staff in a program that offers a focus and innovative approach. Ph.D. candidates have a supervised research experience with law school faculty. Due to the intense nature of the program, Ph.D. candidates are encouraged to publish during their candidature; to present at national and international conferences; to practice classroom teaching; and to report on their research to their deaprtment and the law school Faculty. iv) shall be Judge of any State High Court in India with three years experience or Judge of Supreme Court of India. v) The Vice-Chancellor may permit a member of the Rama University, faculty to take up Ph.D. Degree course along with his / her teaching assignment in the interest of faculty improvement on the condition that his / her teaching and other responsibilities are not hampered in any way provided such candidates fulfill the conditions prescribed in the Ph.D. Regulations. b. The scholars possessing M. Phil. Degree may be exempted from taking the Research Methodology paper in the course work provided they have completed such course earlier. c. The Ph. D. scholar shall secure at least 50% of marks in each paper. d. The course work shall be completed within six months from the date of registration. e. A Ph. D. scholar failing to secure 50% of marks in the courses mentioned above, may be provided an opportunity to re-appear one or more time(s) within three months of the publication of results. f. The Ph. D. scholar shall be allowed to continue further research work only after completing the course work as mentioned above. The 'clinical method' of legal education is another innovative method of teaching adopted by Faculty of Juridical Sciences, Rama University, which tries to integrate actual fieldwork with classroom instruction. It is a valuable method of self-study under supervision. It develops in the students varied skills in collection and assimilation of knowledge and critical writing. It helps improve his/her analytical abilities and communication skills. 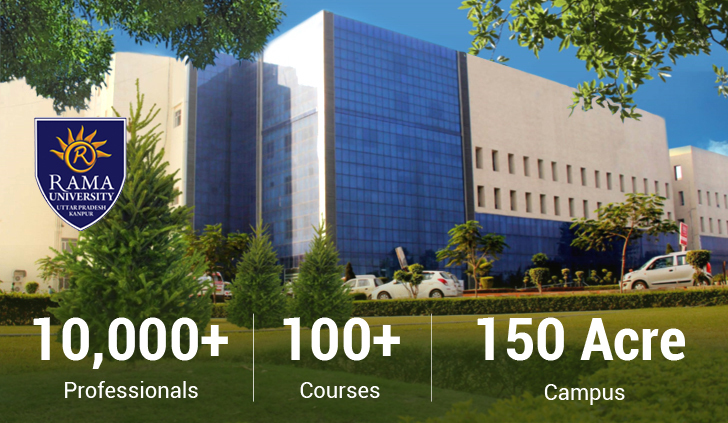 The Law School has a unique and innovative curriculum in which Practical Training occupies an important place. Practical training attempts to expose the students to different aspects of legal work in lawyer's chambers, courts, administrative offices, quasi-judicial establishments, prosecution departments, police and correctional institutions, commercial corporate establishments, government law offices, legal aid centers, legislative secretariats, etc. Placement Training also aims to teach professional skills, essential aspects of professional ethics and social responsibility issues and management of challenging situations in practical and professional life. It further provides opportunities for public service, developing useful professional contacts and for relating theoretical knowledge obtained in the library and the classrooms to social realities. On or before August 15 each year, the students are to make an application, in the form prescribed, for Placement during January-March the next year and submit the same to the Placement Officer. She/He will correspond with Advocates, Judges, Law Officers, companies and other establishments of law to get their willingness to accept the candidates on placement. On receipt of their willingness, the candidates concerned will be informed to prepare for undertaking the assignment. During the first and second years, the placement is optional and will be with NGOs. During the third year placement with trial lawyers, during the fourth year with appellate lawyers and during the final year with law firms and others is compulsory. Early in January all placement candidates will be given an orientation on the work to be done, procedure to be followed, records to be kept, reports to be written and the standard of respect, loyalty and professionalism to be maintained while under training with various organizations. They have to maintain a diary and on their return in March, a viva-voce is conducted to help evaluate the work done during past 6 weeks. 1. Career guidance is done in the IVth & Vth year by inviting people from various areas of legal practice including law firms. 2. The students are provided with the opportunity for being selected by professional seniors as well as reputed law firms and companies. For this purpose, the Recruitment Committee (RC) will be constituted by the IV year students.